For use within a well casing to supply current to a submersible pump. For use where the cable is not subject to repetitive handling required by frequent pump-unit service. Maximum conductor operating temperature: 75°C at voltages not exceeding 600 volts. Minimum operating temperature is -25°C. 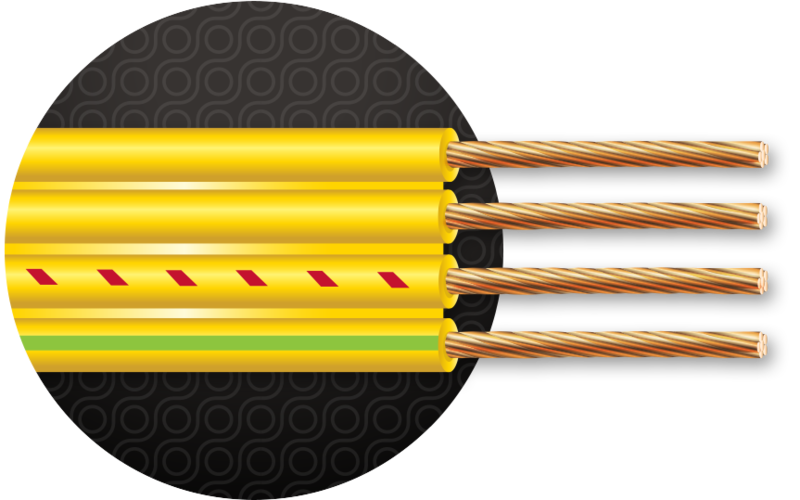 All conductors, including the ground wire, are laid flat and parallel and are covered with a yellow PVC insulation rated 75°C (Type THW). This PVC compound forms an interconnecting web between the conductors. One conductor is marked with the sample surface print shown below plus sequential footage markings in black. One conductor is printed with red hash marks. On three-conductor cables with ground, the fourth conductor is unmarked.